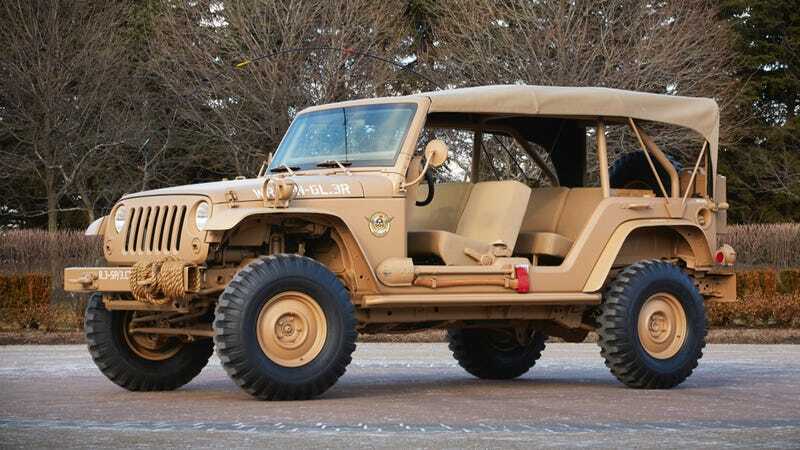 Of all the customized current-body style (JK) Jeep Wranglers, this is probably the closest "homage" to the original Willys army rig they're descended from. The concept is pretty simple; just hack out the B-pillar, ditch the doors, trim fenders, and hose the whole thing down in Sandstorm paint. If you let your eyes go blurry it actually does bear a striking resemblance to the original. Especially if you don't look at the windshield. It's fitted with Jeep J8 front and rear bumpers, fender-mounted blackout lamp with guards and a rear-mount spare tire, rubber all around is 35" Firestone NDT military tires. A 2" lift, Fox shocks, and Dana 44 axles finish the build out, but favorite part is the 85-can cooler "inspired by an old artillery box." Jeep calls the stretched canvas roof "hungry horse" style, which I don't understand and hope someone will explain in the comments. Here's an actual Army Jeep from the era they're trying to emulate... I think they did well. Every year Jeep brings funky one-off prototypes to the "Easter Jeep Safari" event in Moab, Utah. It's basically the biggest scheduled gathering of Jeep nerds in America, and for 2015 (March 28 to April 5th) we'll see seven of these concepts in action. We're heading out to drive some of them, stay tuned!